A looting raid on a church is a common enough Dark Ages scenario. It's applicable to most games, one way or another. For this you need (obviously) a church. Churches are nice pieces to add a bit of interest to a table, whether as an objective or just as a point of reference, and every wargamer should have one (or more...). Now, I already have a Dark Ages church. However, this is a Saxon church, and for Dux Brit, we are talking about a time when a Saxon church was a contradiction in terms. So, I need a nice Sub-Roman church. At Silchester, in Hampshire, the foundations of a Romano-British church survived in excellent condition. An overview of the archaeology can be found here and here. Even better, a floor plan can be found here. Now, there's one problem with the church at Silchester. Actually the problem comes about because the church is in Silchester. Silchester was a large town in Roman times, with a forum, amphitheatre and extensive walls. An attack on Silchester (and hence its church) would not have been a raid, or a skirmish, but a knock-down, drag-out battle. So the large, complicated church from Silchester goes out of the window, and a smaller, simpler version replaces it. 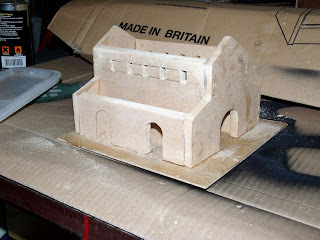 Basically, I took the Silchester ground plan (and the Reading reconstruction) and removed the vestibule, porticos and apse, leaving a building with a simple nave and two aisles. Much more plausible! You can knock yourself a plan up from these resources. Note that the nave of the church at Silchester really does have non-parallel walls! I have no intention of trying to reproduce this, but of course if the building goes a bit of an odd shape, well, it's still totally authentic! The first quandary is the construction method. A building like this lends itself to carving from multiple blocks and joining these together. Of course this offers no chance of an interior. Now, whilst an interior isn't exactly vital, it might be quite nice to be able to put figures inside, whether a raiding party, or some defenders, settling in to give someone a nasty little surprise. The plan gives a width to the foundations of 2' to 2'6". Assuming the walls are a bit narrower, this gives a scale thickness of about 8-9mm. MDF in 9mm thickness is easy to work with, inexpensive and tough as old boots. 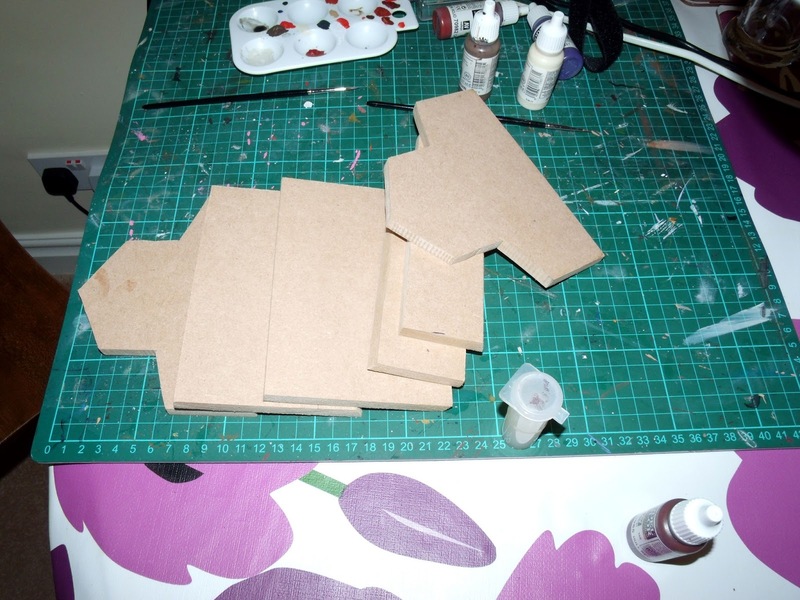 So, 9mm MDF it is! The parts list comprises the two gable walls for the nave, two long walls for the nave and two walls for the side aisles. The roof sections will come later. Following a slight hiatus (while my table saw was otherwise engaged, acting as a storage area for bedroom furniture, mutter mutter...) I was able to crack on with this. Nearly everything is fairly large, straight pieces (with the exception of the gable walls) and it was very easy to rip out some suitably wide strips, then cut them to length on the chop saw. 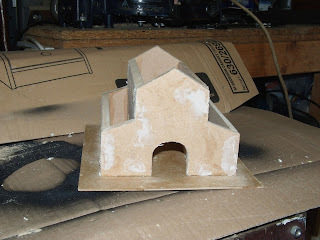 The nave walls were cut using the scroll saw and a paper template. Windows and doorways are added at this stage. The scroll saw for the doors, with a bit of gentle chiselling for the windows, makes light work of these. With WarBases double door ready for fitting. The bits were assembled in two stages. After priming all the glue surfaces with a good coat of PVA (MDF is a bit thirsty, remember! ), join the walls of the nave to the ends of the nave. Then add the side aisles. The beauty of 9mm MDF is you can glue it and reinforce the joints with brads or staples, taking great care to make sure everything is square. 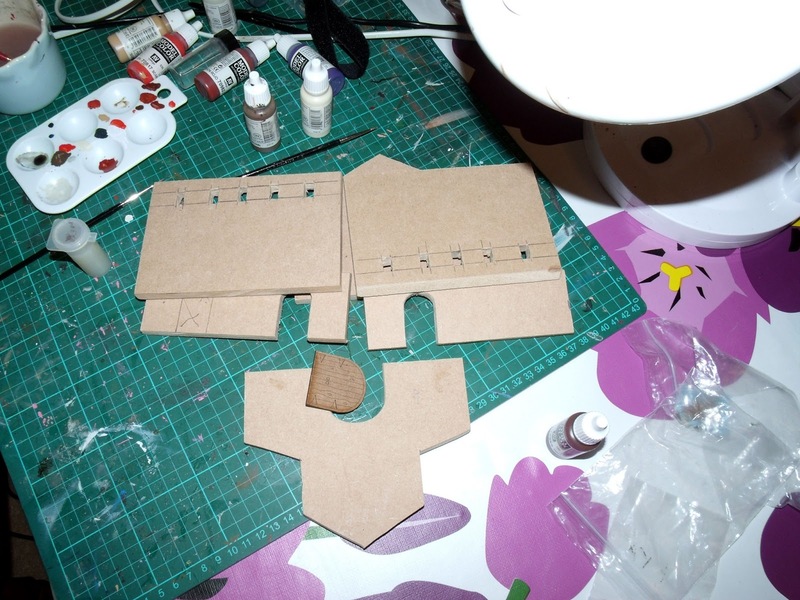 Once all the bits were brought together and joined, they got fixed to a 3mm MDF base. A quick dab of decorator's one-strike filler into the nail holes and cracks, and it's ready for the next stage. Cover up the nail holes! Well, it's vaguely church-shaped, and that's enough for now. Looks like this will be a real beauty. I'll follow your progress closely. Really interesting project. I like the use of MDF, I find it easy to work with. I look forward to seeing the finished church. This is great. I want to copy this.